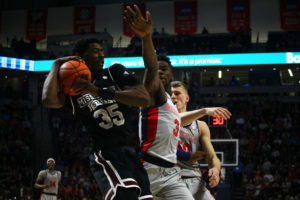 The last time Ole Miss and Mississippi State squared off on the hardwood, the Rebels had their way with the Bulldogs, cruising to an 88-61 victory inside The Pavilion behind Terence Davis’ 18 points and Sebastian Saiz’s double-double (17 points, 11 rebounds). In that game, Mississippi State’s Lamar Peters left midway through the second half with what head coach Ben Howland called a hip pointer. Backup point guard I.J. Ready didn’t play in the first meeting due to an injury. Now, the Bulldogs will have a chance at redemption in the second meeting, which will take place Tuesday night (8:00 p.m., ESPN2) inside Humphrey Coliseum in Starkville. Mississippi State (14-12, 5-9 Southeastern Conference) is 94-25 in games played in Starkville, but Ole Miss (16-11, 7-7) has won six of the last seven matchups against the Bulldogs–the Rebels’ longest winning streak against Mississippi State since winning eight straight from 1980-83. Ole Miss and the Bulldogs play for the 256th time Tuesday night, which makes this heated rivalry the SEC’s most-played. Both teams are trying to finish strong in the last four games of the regular season before the SEC Men’s Basketball Tournament in Nashville, Tennessee next month. The Rebels are coming off a 98-80 loss on the road to Arkansas, a game in which Ole Miss allowed the Razorbacks to shoot 41.4 percent from deep. Guard Daryl Macon made 6 of 9 from beyond the arc for a game-high 30 points. Before the loss, the Rebels had won four of their last five games. Due to the loss, combined with Tennessee and Vanderbilt winning at home on Saturday, all three teams are tied for sixth place in the league standings. Mississippi State, on the other hand, has lost four straight and six of its last seven since starting SEC play 3-1. Ole Miss will need to win three of its final four games to finish in the top six of the SEC, and a win over the Bulldogs will definitely be a start to 10 wins in the league. Mississippi State has relied on the guard play of I.J. Ready, Quinndary Weatherspoon, and Lamar Peters to lead the Bulldogs’ offense, but injuries have hindered Mississippi State from running a steady offense with Ready’s absence. Weatherspoon has been on his own for the most part in league play, while Peters has played hurt. Against No. 15 Florida, Weatherspoon was the Bulldogs’ only double-digit scorer (17 points), but he made only 8 of 20 shots from the field. Peters and Ready combined to score 10 points on 4 of 17 shooting. Taking Ready and Peters out of the game early will definitely make Ole Miss’ defensive assignments easier against Mississippi State. Senior forward Sebastian Saiz hasn’t had a double-double since the Rebels’ 75-66 loss at Tennessee, where he finished with 13 points and 15 rebounds. Against the Bulldogs Tuesday night, Ole Miss will need Saiz to tally numbers similar to those he notched against the Vols. In the game with Arkansas, Saiz had eight points and five rebounds, while Deandre Burnett and Terence Davis carried the scoring load against the Razorbacks. 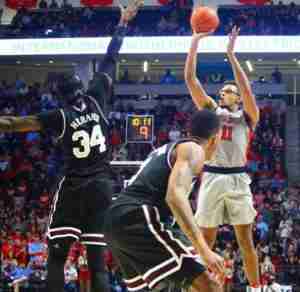 If Saiz can have a big game against Mississippi State, along with solid play from his teammates on the perimeter, the Ole Miss offense will be difficult for the Bulldogs to stop. Mississippi State likes to shoot from long range. The Bulldogs had some open looks from deep against the Florida Gators but were not able to convert very often. Mississippi State finished 2 of 23 from beyond the arc, including 0 of 13 in the first half. For the season, Peters has made a team-best 53 3-pointers for the Bulldogs, while Weatherspoon has made 37.7 percent of his shots from long range. Peters and Weatherspoon made the only two three-pointers against Florida on Saturday. Ole Miss and Mississippi State tip off in Starkville Tuesday, February 21 at 8:00 p.m. (CT) in Humphrey Coliseum. The game will be televised on ESPN2. Tom Hart will have the play-by-play call, while Alphonso Ellis will handle analyst duties.